角色 - 机器人. 角色点: 6. 生命值: 6. 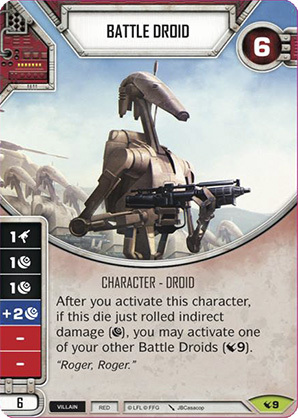 After you activate this character, if this die just rolled indirect damage (), you may activate one of your other Battle Droids (9). 原作者为 Alsciende (NetrunnerDB and ThronesDB).